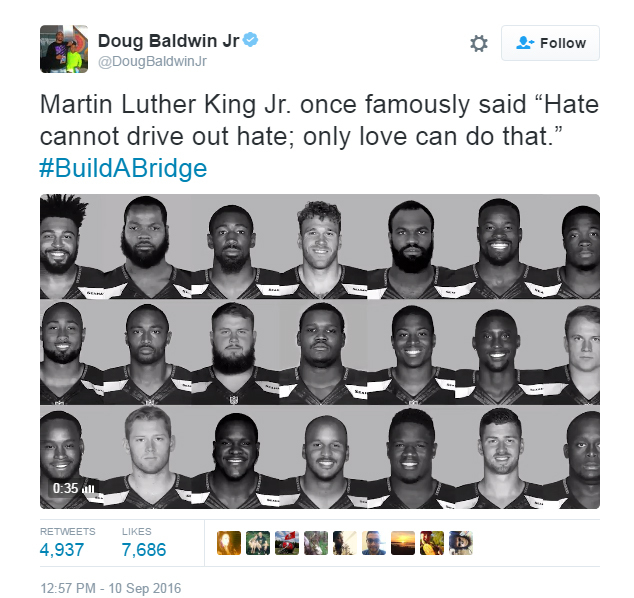 Yesterday my heart was warmed and it came courtesy of my native state’s NFL team. After much speculation by the media on what the Seattle Seahawks would do during today’s National Anthem, Doug Baldwin posted a video on social media explaining what would occur. Later today when my favorite football team hosts the Miami Dolphins, the players will link arms and stand for the Star Spangled Banner. They will line up in a way that athletes of different races will be linking arms. Baldwin says that the powerful display will signify unity for each other and this country. This is a screenshot of Doug Baldwin’s video he sent out via his social media accounts. I fully support everyone’s right to protest. I recognize all of the individual actions taken in the last few weeks. For that matter, I recognize all of the acts taken in the history of this great country. Because of the bravery of the men and women who defend our country both at home and abroad, we are given this right. It is a beautiful thing. If it wasn’t for people much better than me, I would not have the right to write Don’t Blink. Along the same lines, others would not be able to engage in other displays of self expression. Sometimes we are mindful of this and sometimes we are not. Today is 9/11. On this day 15 years ago, 2,996 people were killed because of hatred. Of that number, 71 New York Police Department officers perished trying to save those impacted by the evil act. Thousands of military personnel would later die because they were overseas making sure something like this would never happen again. On September 11, 2001, this country was attacked. A large amount of our people died just because they happened to live in America. If not for the NYPD and NYFD, thousands more would have perished. If not for our military, perhaps millions more would have perished in future attacks. Like I said, I am so grateful we live in a country where we are able to practice self expression. However, like I also said, I think sometimes we need to also take into account the context of how we enjoy these freedoms. This blog post is not a slam on Mr. Kaepernick. He has stood up for what he has believed in and I respect that. He has started a movement. However, today is 9/11. I am grateful that the Seattle Seahawks have recognized this and will stand with unity during the National Anthem. Today is not about protest. Rather, today is about remembering the civilians, police officers, fire fighters, and military personnel who paid the ultimate sacrifice. Don’t Blink.